Enter the Lowepro Stealth Reporter D650 AW. Created for photojournalists and news photographers, the Stealth fits all that I need for a professional photoshoot or trip: 1 DSLR with 70-200mm f/2.8 lens attached; 1 additional body; 2 lenses; and 15” Macbook Pro; plus, up to 12 memory cards; flash; chargers and cords. Built to go the distance, the Stealth delivers typical Lowepro quality; it’s sturdy, well-thought out with plenty of room and cushioning, and has pockets for everything. Favorite feature: The convenient quick-access zip top is brilliant. Unlike a backpack or standard shoulder bag, everything I need is only a zip away. Not-so-favorite feature: I wish the Stealth had a top grab handle in addition to the sturdy shoulder strap. There is a narrow strap that enables you to pick up the bag without using the shoulder sling, but it’s a bit awkward. Bottom line: While the Stealth may be the perfect camera bag for getting equipment from point A to B, it’s BIG. Big enough that you’ll still need something smaller, like the new Photo Hatchback, for instance, to use as a daypack when you get where you’re going. If you like a lighter, softer bag, just take out the padded insert. 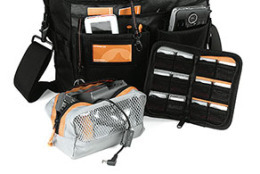 Removable pouch and memory card wallet easily manages all your digital accessories. Water-resistant top zipper provides quick access to gear. The All Weather Cover™ provides serious protection for your gear in extreme conditions. Padded laptop compartment fits most 17” widescreen notebooks.